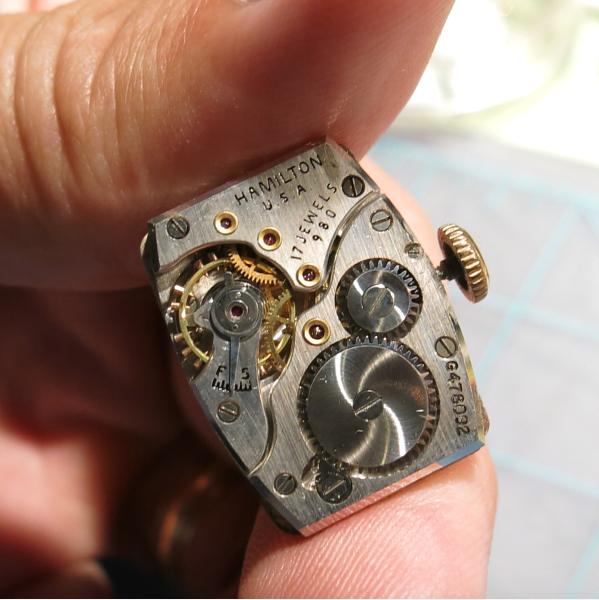 Well, I started out this month showcasing some of Hamilton's smallest men's watches and I guess I'll close out the month with another one. This one is the 1940 Emerson. The Emerson is an interesting watch with hidden lugs so you can't see (from the front) how the strap attaches to the 10K gold filled case. The sterling silver dial with solid 18K applied gold numerals is shared with the 1939 Bowman, which was produced only in 1939. Being in a 10K gold filled case, you'd assume the movement inside would be a 17 jewel 14/0 sized 980 - and you'd be correct. 14K gold filled models would have a 19 jewel 982 movement. The Emerson was produced from 1940 through 1946, with a slight disruption due to WWII military production. 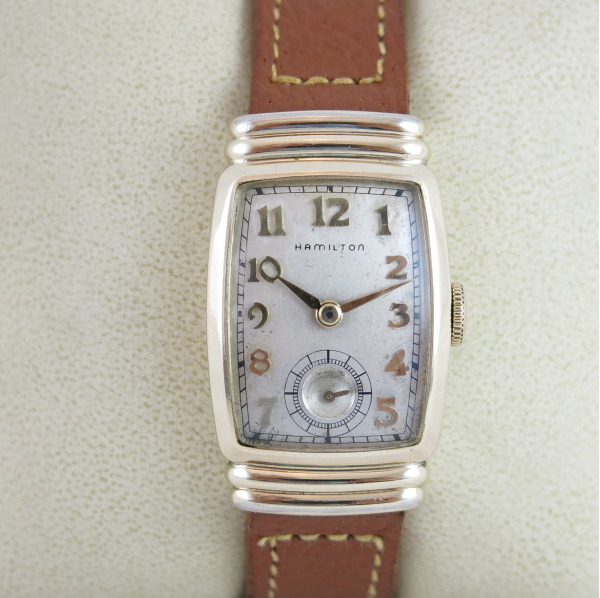 A modern "registered edition" version of the Emerson was produced by Hamilton as a ladies watch. It's a very accurate homage to the original - although it has a quartz movement - and you'll see from time to time on eBay. I've restored several Emersons over the past few years. It's not the smallest watch Hamilton ever made but I'd probably put in the top five. I recently picked up another project watch. 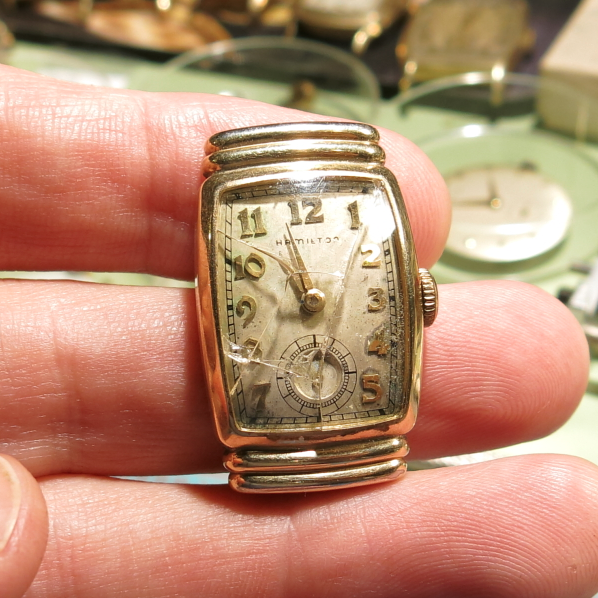 The case was in great shape but the dial was very dirty and the crystal obviously in need of replacement. With the bezel removed from the case back, you can see that the dial is very dirty but appears to be original. That's a good sign, as original dials will usually clean up better than a refinished dial. Behind the dial is the 980 movement. At this point in time, the 980 was a pretty plain looking movement without damascening. The serial number on the barrel bridge dates the watch to 1946 - the last year of production for the Emerson. 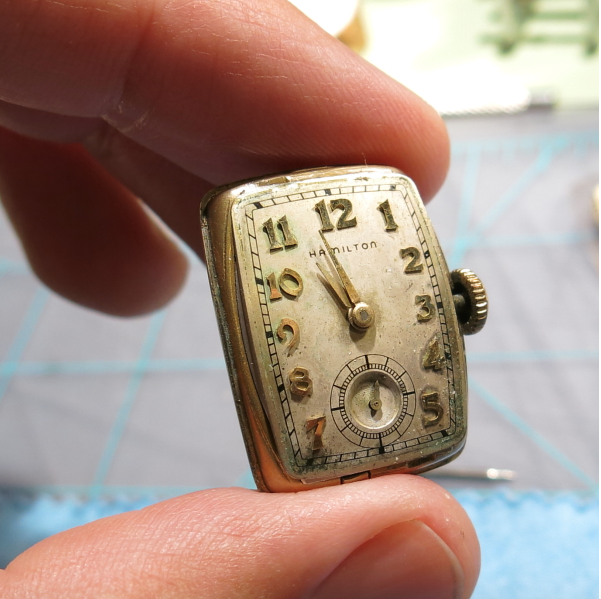 The movement was completely disassembled, cleaned and oiled with a fresh white-alloy mainspring. 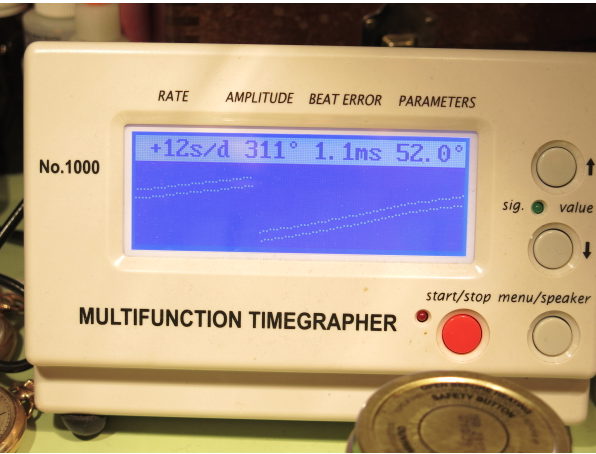 Once it was re-assembled, after a little tweaking it ran great on my timer (below). Interestingly, when I put the watch on it's side (with the 9 down) it would slow down considerably. I'm just a really advanced hobbyist - not a professional - so I occasionally get stumped by a movement that runs like this. Every "wheel" in the watch runs on an axle (called an arbor) with tiny metal pivots on the ends that ride in a jeweled bearing with oil in between the pivot and the jewel. When a watch is dial up or dial down, it's only really running on one end of the arbors but when you put the watch on it's side, all the pivots are in action so twice the friction is applied. Running poorly in one position but not others could be caused by a variety of things ranging from dirty jewels to bent pivots to cracked jewels. So I had to take it all apart again and inspect every pivot and every jewel. I didn't see anything obvious but it still took me about 2.5 hours to get all the pivots and jewels cleaned to the point that it would run well in all positions. But I eventually got it. What exactly was the cause is still a mystery though. The dial cleaned up really well, I think. Still a little bit of toning around the perimeter but when cleaning dials the trick is to know when to say when - as too much cleaning will wipe the printing right off the dial. Paired with a period-correct pigskin strap and with a new glass crystal installed, this Emerson looks much improved over what I started with. I also replaced the crown with a less worn example - so this watch is ready for another 70 years of service. 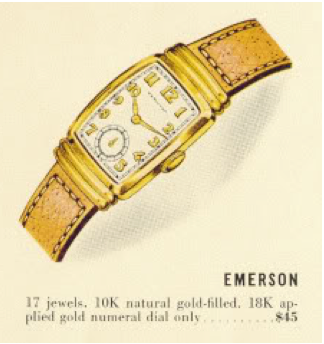 If it's an Emerson like this one (gold filled) then a jeweler could easily change the band on it. It would have come on a pigskin strap as shown - but any 14mm strap of your choosing would work. How do I contact you to restore my dad's 1940's Emerson watch? You can contact me through my Etsy shop - although I don't tend to take on other people's projects. I can refer you to some pros that I have used and respect. Hi Im new here I have a question. 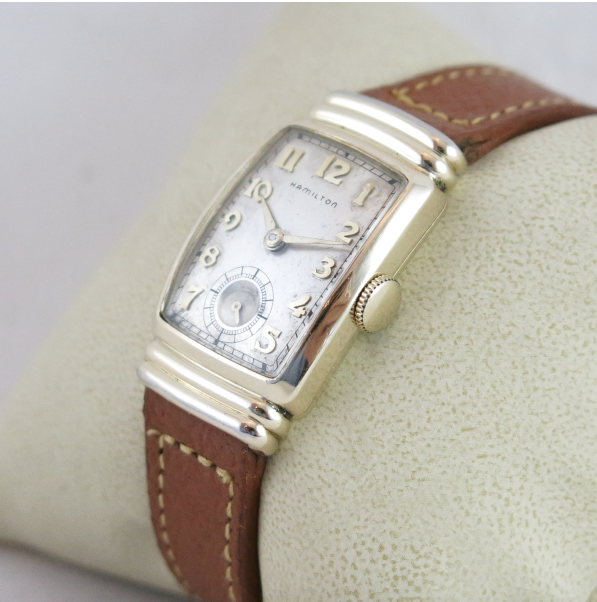 I have a Hamilton Emerson watch from 1940's but I want to know the exact date. The serial number is : G472872. Look on eBay for closed auctions to get an idea of what things sell for. I'd say $200-$250 is fair if it's in recently serviced condition but it really depends on the specific watch. Hi, great job on the watch. Where did you find the crystal for that watch? I have a cracked crystal. Any info is helpful. HI Dan - what size strap does the Emerson take?